Drop Panel Kits for the Propper Defender Delta jacket. Consists of a reflector sewn to the blank panel that zips to the two front positions and the back. Each set comes with two small panels for the front and one large panel for the back. 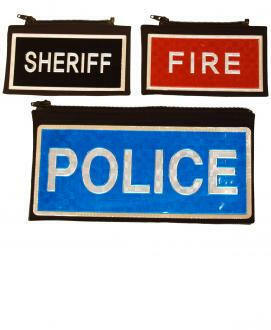 Available in blue (POLICE), black (SHERIFF) or red (FIRE). Note: The Delta Drop Panels are assembled when ordered and may require up to one week before they can be shipped.